I’m haring another Autumn-themed card today, although I’m not sure where the season went! It was 31 degrees outside when I woke up this morning! To start off this card, I loosely painted a watercolor panel with several colors from my gansai tambi watercolor pallet. I wasn’t sure what to do with this panel at first, because I didn’t immediately love how it turned out out, but I stuck with it. 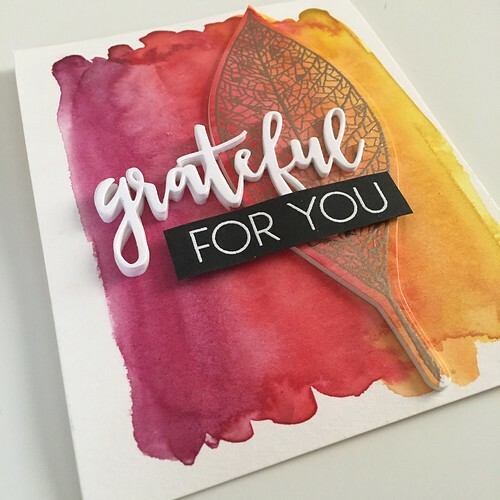 Using the leaf die from the Grateful Leaf die set, I cut the leaf shape from the panel and then stamped and heat embossed the Lace Leaf on the cut out using liquid platinum embossing powder and my heat tool. I really love how pretty and delicate the leaf image is. 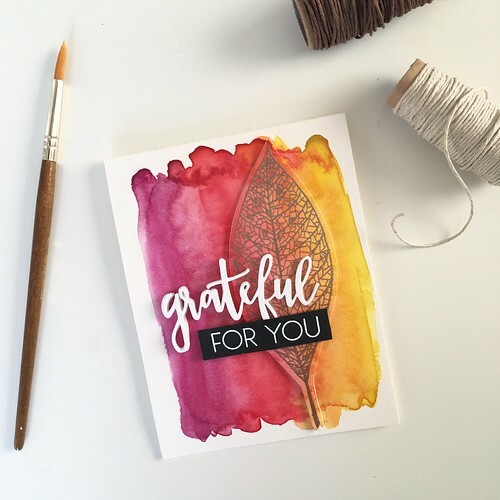 The sentiment consists of the grateful word die from that same Grateful Leaf die set and the “for you” (from part of a larger sentiment in the Cozy Christmas stamp set) is stamped in Versamark Ink and heat embossed with white embossing powder on black card stock. I set the leaf cut out back into place on the panel, but made sure to pop it up on some fun foam to give it some separation and dimension. 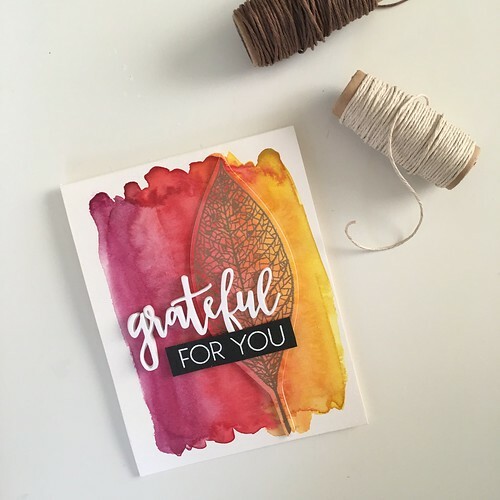 I also layered fun foam behind the grateful sentiment and added some behind the strip of black card stock, too. This card has lots of height, baby! 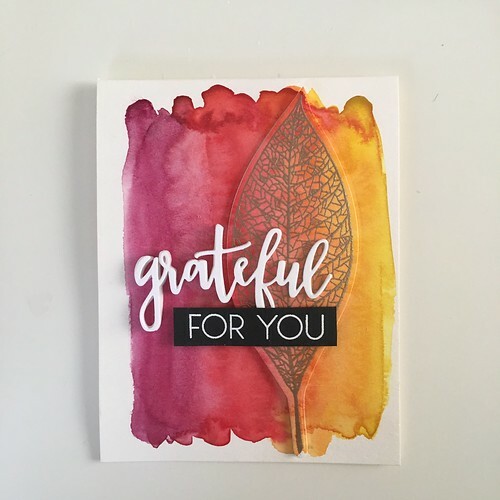 The colors of this card remind me of all the beautiful leaves on the trees outside. I love this time of year! Minus the fact that it was 31 degrees outside this morning…And the fact that it may snow here tomorrow (!). I’m going to do my best to pretend there’s still a lot of Fall left to be had! I love the watercolor panel on its own but the delicate leaf really seals the deal!